.:sP:. Seed Pod Press is a very small independent publishing company devoted to all things to do with living and growing, especially herbs, other plants, and gardening. 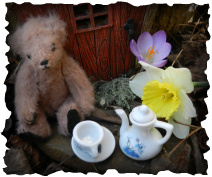 Our first book had a 2nd edition out in April 2012 with a new chapter on herbal teas for children. The illustrations for it, created by some tea-loving children, are delightful. It quickly sold out. We are sorry but no more copies are available to order. 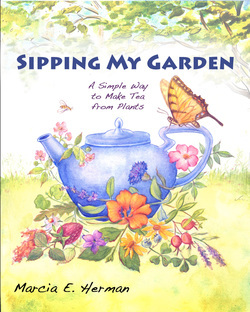 Sipping My Garden was first published early in 2012 and sold out within the year. A small and charming book, it is perfect for gifts. More people are joining the local food movement, eschewing foods shipped for long distances when possible. For teas, this is easy to do if you make your own from plants you can grow or already have in your own garden or purchase in local farmers markets! This delightful book will be sought by all converts to the locovore movement, gardeners, and herbal tea lovers. I’m glad for the book’s suggestion to consult local references about what herbs will grow in any given area. And if growers and herb enthusiasts will follow the simplified plant identifications and precautions, then they will find the pleasures of teas harvested from their own gardens. It doesn’t get any more local than that! The plant kingdom provides us with so much--shade and color, changing seasons, endlessly varied forms in the shapes of leaves, and fragrance, not to mention the basis of our food supply. That plant diversity harbors another secret: plants are a virtual library of interesting compounds, many that evolved with the animal kingdom and so are able to interact with animal physiologies, including our own. Marcia E. Herman’s writing, in an easy-to-read way, shows how this chemical diversity furnishes us with a great array of teas as she gently leads us into its emotional, medicinal, and aesthetic pleasures. This lovely book will open your passion for these delights. Marcia rightly looks to herbal teas for leisure and pleasure. I think of herb teas as the best of medicines. Leisure and pleasure are good medicine, and phytochemicals are good medicines. Here’s to your health, sipping your garden teas.